This contemporary Design has 4 round brilliant diamonds set with 2 on each side of the engagement ring and another 5 round brilliant diamonds on the wedding band. The total carat weight is 0.20ctw. It is 14k white gold but can be ordered in platinum or yellow gold. This ring is set up for a 1-1 1/4ct round centerstone. Everything on this site is completely customizeable. 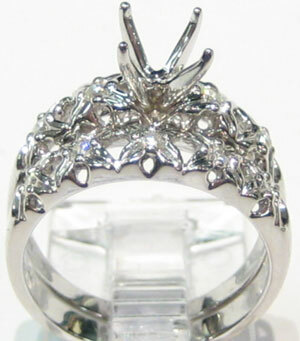 The head on this ring can be easily swithed out to accomodate any size and shape centerstone you wish. Just choose from the options on the drop down box. If you would like to add a Certified diamond from our certified loose diamond database, just choose the "Set My Certified Diamond" option in the drop down option menu. You will have to then go to our Certified Loose Diamond database and purchase your diamond seperately. As long as you check the "Set My Certified Diamond" check box, the two orders will be cross referenced and the diamond will be set in the ring before being shipped. If you have any questions about this process or would like to come in and view our huge selection of Engagement Rings, Semi Mounts or Certified Loose Diamonds, just call 1-877-289-9465.